President Manfred Rekowski gave his annual report to the regional synod. “We must speak publicly and openly about what we care deeply about: faith in a God who is close to human beings, the Father of Jesus Christ; faith in Jesus Christ and in God’s good Spirit,” said the highest representative of the Rhineland Church. Using the example of social policy President Rekowski made clear where faith pushes one to action. A large percent of children in the rich country that is Germany are growing up under conditions resulting from the Hartz-IV welfare reforms. Studies have shown that many families are not able to afford to meet unplanned expenses in addition to the daily costs of living. Rekowski also reminded delegates of the need for more intensive discussion about biological and genetic engineering. In this regard he lifted up both the new genetic engineering method commonly called “gene scissors” that makes it possible to change human DNA in a targeted manner, as well as a non-invasive prenatal test for Down’s syndrome, which as a standard service provision of health insurance companies in Germany presumably would lead to children with this chromosomal difference simply no longer being born. A particular challenge for the Rhineland Church lies directly on its doorstep in the northern part of the regional church. For many years the leaders of church districts in regions affected by brown coal strip mining have been in close discussion with those working in the mining industry, as well as with those who have lost or are losing their ancestral homes due to mining. “Altogether, five of our church districts are affected by brown coal strip mining. Over 450,000 Rhineland Church members live in the area. I am grateful to all of those who are holding these conversations, conversations in which, generally, there is a clash of different interests. Nevertheless, the Church, with its mission and biblical roots, has a preferential option – firstly, a preferential option for the poor. And a preferential option for the integrity of creation,” President Rekowski underlined. 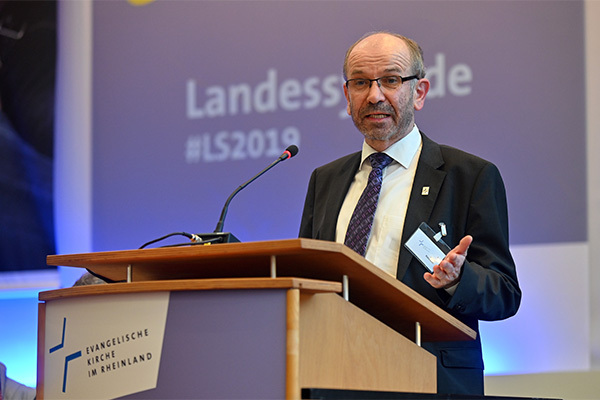 There were challenges as well when one looked inside the Church, underlined the top representative of more than 2.5 million members of local church congregations between the Lower Rhine and the Saarland. “In year one after the Reformation anniversary, we have to acknowledge with a look at the statistics that the number of worship service attendees has decreased further. Do our worship services, and how we worship, make our churches even more like insider spaces, not open to wider society? In this aspect as well we are a Church in need of change. Therefore, I’m thankful for all initiatives taken by local church congregations and councils to explore and live out new and different forms of Christian spirituality, and for those who see worship services as more than just a routine task to be taken care of,” Rekowski said.